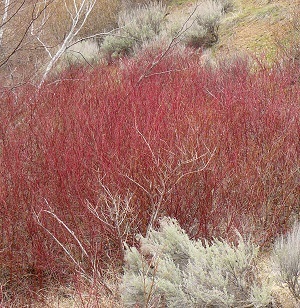 The stems of Red Twig Dogwood (Red Osier Dogwood) turn brilliant red in the fall and are gorgeous all winter. Turning back to green in the spring, the shrub leafs out and then produces clumps of small white blossoms that are popular with pollinators. Tolerates a range of conditions. Can be pruned for shape. Nectar and pollen source for native bees and butterflies. More information here. Height x Width: 7-10 ft. x 7-10 ft.